Any questions for Iain Duncan Smith? Iain Duncan Smith led the Conservative Party from one day after 9/11 and until he lost the support of Tory MPs in November 2003. His leadership was dominated by the first two years of the war on terror. He supported both the liberation of Afghanistan and the war against Saddam Hussein. Although he emphasised Euroscepticism (notably in his Prague speech), lower taxation and a massive expansion of police numbers, IDS also attempted to use his shortlived leadership to steer the Conservative Party towards a greater concern for Britain's poorest communities. His last major decision as Tory leader was to commit the party to restore the link between the basic state pension and earnings. After losing the Conservative leadership he founded the Centre for Social Justice to carry that work forward. The CSJ has aimed to increase the Westminster establishment's understanding of community-rooted poverty-fighting organisations. One of David Cameron's first acts as Tory leader was to put IDS in charge of the first policy review group - into social justice. From the backbenches IDS has led cross-party opposition to Labour's Mental Capacity Bill, foresaw the importance of right-wing blogging and campaigned successfully for a commemoration of the WWI generation. 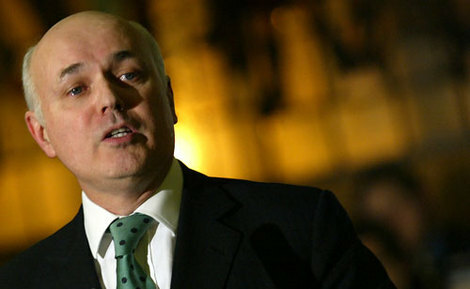 Please use the comments thread below to raise questions for IDS or email questions to Tim. 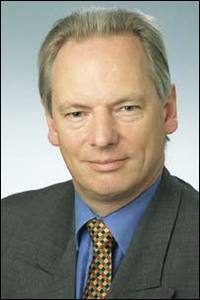 Francis Maude has given ToryRadio another extensive interview, answering questions asked on ConservativeHome. Click here to listen to it or read the brief summary below. We were out-campaigned, we need to be hungrier and will do things differently in the future. David Cameron should have been used more. Spoke of setting up a TA-like unit (Territorial Army) which will consist of volunteers who take out time for by-election campaigning. Asked ToryRadio and ConservativeHome punters if they would like to join this crack campaigning team. Bloggers can push the envelope more. Wants them to come out of the shadows and join the bloggers' corner at party conference. He also said Guido was welcome, denying allegations to the contrary. Didn't close the door on the idea of more taxpayer's subsidy to political parties, but was personally reluctant to support it. Priority is reviving party at the grassroots on the ground. Doesn't expect to have next tranche until well into August. Learnt a lot from the process which has by and large gone well so far. Believes it is right to leave the grouping but also to form the right kind of new one. Would have already formed it if the Czechs hadn't asked for a delay. Strong sense of direction and strategy. Need to be flexible but have a clear view of how we want to be portrayed and what our vision for Britain is. Don't have everything worked out however, just trying to do our best to get a Conservative government. "Old Hack" asked if this was merely "a Maude PR exercise". Francis said he should take a chill pill and lie down for a bit. You don't see the chairmen of other parties holding themselves accountable in this way, it is worth listening to this interview in full (if only to hear Jonathan Sheppard's A Team ending to the show!). Following on from the first extremely successful "Challenge the Chairman" slot brought to you be Tory Radio and ConservativeHome, you now have another chance to put your questions to Francis Maude, Chairman of the Conservative Party. Where does the Bromley by-election leave the party? Has the EPP decision seriously damaged David Cameron's credibility? Is the A list on track to deliver its intended objectives? The questions will be put to Francis by Jonathan Sheppard from Tory Radio on 18th July. THE LATEST TORYRADIO INTERVIEW - WITH FORMER CHANCELLOR KEN CLARKE - IS NOW ONLINE. 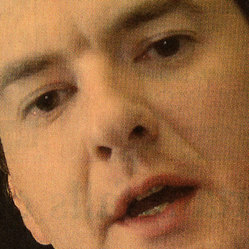 Last week you asked George Osborne a number of questions, he answers a selection of them here. Aaron (1): In a new Conservative Government, what would be the long term economic policy and intended effects? The goal of our long term economic policy is to enable rising living standards for everyone. That means preparing Britain to compete in the new global economy with emerging giants like China and India. We’ve set out a number of ways that we’d do that, including a broad programme of tax reform, a triple-lock on economic stability, and sharing the proceeds of growth between real increases in spending on public services, and lower borrowing or taxes. I’ve highlighted the need to enhance innovation, not by top-down Government initiatives, but by strengthening the framework for business then getting out of the way. My recent trip to Silicon Valley highlighted the need to update our intellectual property laws and improve education standards so that we can compete in an age where knowledge will be the key driver of success. Aaron (2): Can you make any suggestions as to the housing market boom - why has there been such an increase? Has it had economic benifits in the wider context? How can we go about ensuring young people can afford to join the ladder? Unaffordable housing is a key priority for most families in this country. Whether young couples who can’t afford their dream of owning a home, or parents who can see no way for their children to get on the property ladder, the lack of homes we can afford affects us all. Labour’s response is wrong. Their planning system prioritises building on gardens, hospital grounds and school playing fields, just because these valuable green spaces are labelled “brown field”. And John Prescott’s top-down targets leave little discretion for local communities. So we’re setting out a new policy direction for housing that will give local communities power over new building, and gives them the incentive to build enough sustainable, beautiful homes, in the right places. We must build the homes we want and need. Any questions for George Osborne? Since being elected as MP for Tatton in 2001 George Osborne, 35, has enjoyed a rapid series of promotions that saw him become Shadow Chancellor in May 2005. Although he had been widely tipped for the Tory leadership himself, Mr Osborne decided not to join the race to succeed Michael Howard and became David Cameron's campaign chief. Underlying his closeness to the leader he helped elect, Mr Osborne's own office - and that of Oliver Letwin, head of party policy - are now adjacent to Mr Cameron's own. Before entering parliament Mr Osborne was speechwriter and political secretary to William Hague. A committed Atlanticist and supporter of the war in Iraq, Mr Osborne has adopted a cautious approach to tax policy since he became the party's Treasury spokesman. He has emphasised the need to put economic stability before tax cuts although he has emphasised tax simplification and lower taxation of business. He has also championed the interests of start-up media businesses who fear being crowded out by the BBC. 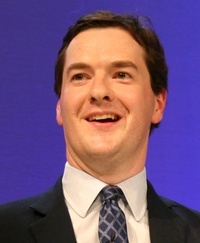 Mr Osborne is married with two children. Please use the comments thread below to raise questions for George or email questions to Tim. Two weeks ago you raised a variety of questions for Lynton Crosby. Mr Crosby is a leading architect of Australian Prime Minister John Howard's successes and was Campaigns Director for Michael Howard's 2005 General Election effort. ConservativeHome selected ten of the questions your posed and Lynton answers them below. Henry Edward-Bancroft: "What mistakes were made at the last general election?" Everyone makes mistakes. There are always things that in hindsight you would do differently. I think the biggest mistake the Conservative Party could make is not to recognise that winning an election does not start with the election – you cannot “fatten the big on market day” as John Howard likes to say. You have to lay the foundations for community acceptance and electoral success well before the election. Labour themselves have shown that it takes a lot of work over years not months for you to be acceptable – a good campaign, a clever advertisement, a popular policy will count for nothing if the foundations have not been properly layed. The first priority for a party that has lost successive elections is to accept that there are things the voters don’t like about you and respond accordingly . Which means that you must change and demonstrate that you have changed. If the voters have rejected you and you don’t change then they are likely to reject you again. This is where Dave Cameron is spot on – you have to show that you have listened, learnt and respponded to people’s concerns and people have to know what you stand for. Taxcutter: "What would you have done differently if you had had 3 years to work on a General Election campaign rather than 6 months?" Spent more timing laying out how the Conservative Party had changed, encouraging the party to engage directly and more effectively with local constituents more effectively, rebuild Central Office – it was more geared to government than opposition - done more to hold local Labour MPs to account for their part in Labour’s failings, done more to demonstrate the positive plans the Concervative Party had developed for Britain. Above all else ensured that voters really knew what the Conservative Party stood for. This all takes time. Francis Maude has spent fifty minutes answering questions posed by ConservativeHome readers and others. 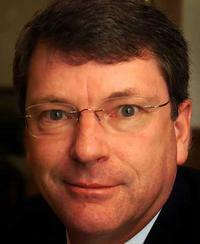 Jonathan Sheppard's exclusive interview can be downloaded from ToryRadio. ...and much more. Click here to listen to ToryRadio's full interview with the Party Chairman. Last Friday Francis Maude used a piece on ToryDiary to seek your feedback on the Bromley by-election campaign.